Part I recalls the first snack shop, thanks to information provided by Janet Weaver Yoder whose father launched the enterprise. Now Helen Ours takes up the story. Say “snack shop “and you’ll conjure a lot of warm memories for alumni of Eastern Mennonite College—and yes, we’ll say EMC because that was the institution’s name when the Snack Shoppe was in its heydey. 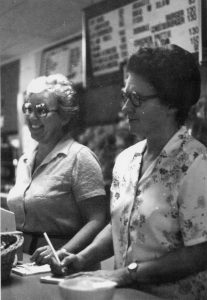 Helen Ours and Lois Shirk in the Snack Shoppe, 1982. Food has always been an important part of the community experience at EMU. Decades ago, the Snack Shoppe – as it was spelled on the north entrance sign where many enjoyed a large swing set before entering – was a central gathering place for food and more. “There wasn’t a 7-11 on the corner, so this is where you came,” says Helen Ours, manager from 1974 through the mid-1990s. “It was one place where boys and girls could be together too,” she notes with a smile. The menu included homemade pastries, cookies, chili, hamburgers and hot dogs, soups, and sandwiches. Rhubarb and apple pie were seasonal favorites. Packaged candy, chips, pretzels and other snack food was sold. It was more than the food, however, that drew people in. Ours and her co-workers created a place that felt like home. The warm greeting by name, remembering people’s favorite foods, the hospitality and ambiance – yes, ambiance – were key. 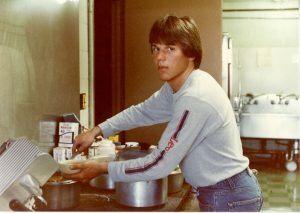 Delbert Wenger ’86 works in the Snack Shoppe in 1984. Ours employed as many as 37 work-study students per semester, covering shifts from 7:30 a.m. to 11 p.m. most days. Delbert Wenger ’86 and his sister Donna Wenger Widrick ’90 are one of several sets of siblings who worked for Ours during her tenure. Helen probably remembers every student who worked for her, says Delbert Wenger. “She’d also probably remember all those athletes who often ‘subsidized’ their hunger after dining hall suppers with something good from the menu. Steak sandwiches were a popular item for hungry athletes,” he remembers. Another view of the cozy shop, with Helen and Lois. Wenger also recalls the trust Ours put in the students by giving them building keys and training them to open, close and run the business. “It was a great atmosphere. Helen was a mother as much as a supervisor to all of us. I think we all loved going to work,” says Widrick. Ours, who now works in the EMU dining hall, says she actually began her career in food service in the campus snack shop, but located in a different place on Mount Clinton Pike. Ours worked there from 1948 through the spring of 1950, under manager by Lydia Slabaugh Martin. In 1958, the new gym and student center opened where the University Commons now stands (which is, in fact, a renovation and addition to the old gym and student center). The new snack shoppe opened with boothes seating and a large horseshoe-shaped bar. Ours no longer worked at the college, but she occasionally saw President Myron Augsburger at high school athletic events (their children were the same age and attended Eastern Mennonite High School). Augsburger’s regular request to Ours: Bring your cooking and managerial skills to the Snack Shop. Ours obliged in 1974. She worked first with Doris Miller. Together they added more food to the menu and spruced up the shop with new window coverings and dining ware. 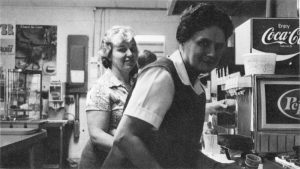 Within a year, Vera Kuhns and Margaret Kauffman, both of whom had husbands working in the physical plant, joined her staff. The “Den” atmosphere is different and the snack shop era is passed. 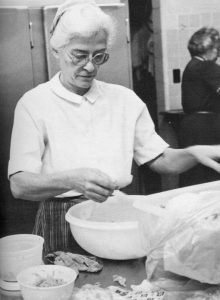 Thanks to Helen Ours and her colleagues, however, many friendships were deepened, problems were solved, and souls fed through the hospitality and home-like comfort she cooked up in the Snack Shop during its glory days. But in her role today with the EMU dining hall, Helen remains a beloved community member, greeting students by name and sometimes with a hug. She is special to athletic team members in particular. She and her husband support them by attending every game or match they can get to.